Sri Lanka President Mahinda Rajapaksa arrived in the United Arab Emirates (UAE) to attend the official opening ceremony of the 7th edition of the World Future Energy Summit (WFES) at the Abu Dhabi National Exhibition Centre (Adnec), as part of Abu Dhabi Sustainability Week. The President who left the island today (20 January) on a one-day official visit for UAE reached Abu Dhabi, the capital City of the Arabian nation. 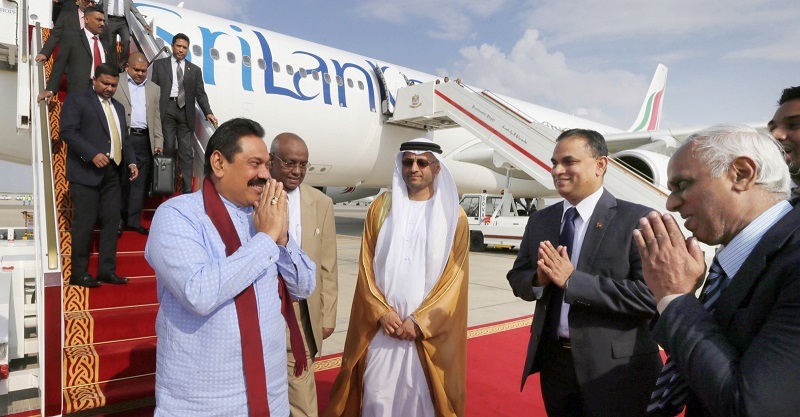 Chairman of Department of Municipal Council Affairs Majid Ali Al Mansouri and Sri Lankan Ambassador in the UAE Dr. Mahinda Balasuriya warmly welcomed the President at the Abu Dhabi International airport. President Rajapaksa is scheduled to take part in the World Future Energy Summit and the Zayed Future Energy Awards Ceremony this evening. In addition the President will also hold bilateral discussions with top government officials of UAE and meet with the Sri Lankan community living in the Emirate. According to the Prize website, the annual award celebrates achievements that reflect impact, innovation, long-term vision and leadership in renewable energy and sustainability. Among the finalists for this year’s award include multinational companies such as General Electric and Wal-Mart, among others. Minister of External Affairs Prof. G.L. Peiris and Monitoring MP of the Ministry of External Affairs Sajin Vass Gunawardena are a part of the Sri Lankan delegation. This entry was posted on Monday, January 20th, 2014. You can follow any responses to this entry through the RSS 2.0 feed. You can skip to the end and leave a response.